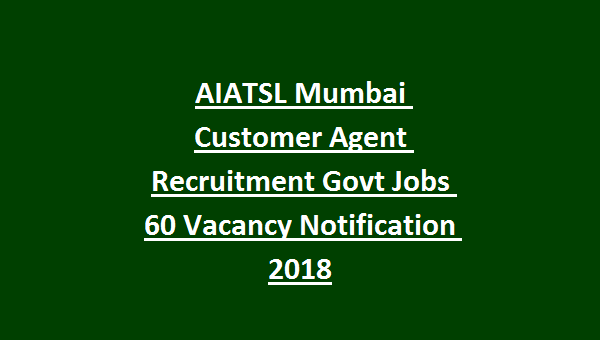 AIATSL Customer Agent Jobs Recruitment 2018: Air India Air Transport Services Limited released a recruitment notification seeking fresh applications on immediate basis from eligible candidates for engagement to the Customer Agent on ground duties at Mumbai Airport. 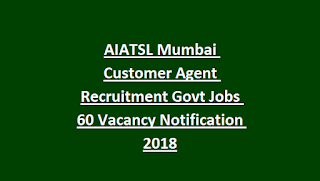 A total of 60 vacancies are available at Mumbai Airport of Customer Agent Post on ground duties as notified by AIATSL. Candidates applying for Air India Jobs must not exceed the upper age of 28 years as reckoned on 01-12-2018. Candidates interested to join Mumbai Airport as Customer Agent must have secured 3 years Bachelor’s degree in any discipline from a recognized University/Institution and also possess requisite Aviation Experience. Candidates who are interested to join Mumbai Airport as Customer Agent will be assessed on the basis of Screening Test followed by Personal Interview/Group Discussion. Candidates seeking possession under AIATSL Customer Agent Posts Recruitment 2018 can refer the official notification.